And this is no occasional crew member, this is a close family member, someone I am very fond of, someone whom I have known all his life and will know for the whole of the rest of mine. 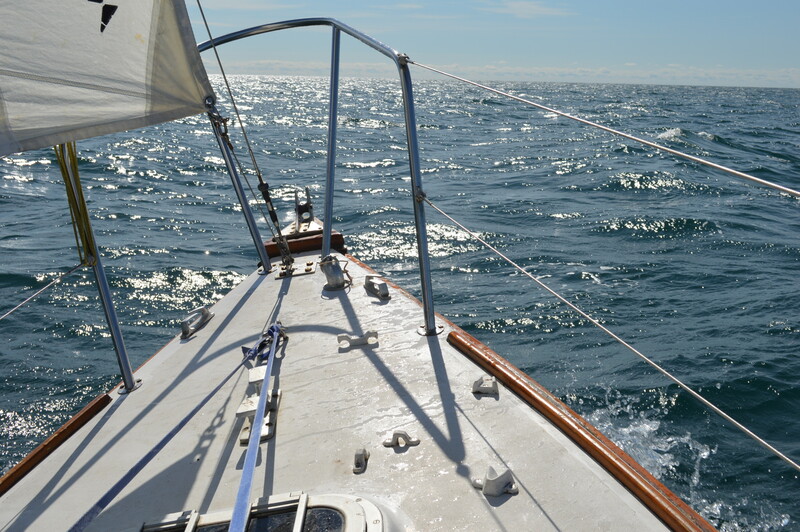 In all the time I have owned the boat, we have only been day-sailing together, never made a longer passage. So these are significant days. We are creating space for the not-so-old father to work with the not-so-young son, both having minds of their own. In an emergency, the traditional hierarchy takes over and the space closes but that’s not how these relationships generally work. In daily life, there is an ebb and flow between us that is stimulating – and occasionally irritating. I don’t want to lose that, (but neither do I want to find us with unnecessary or unexpected problems at sea). We have an advantage that was not there in my relationship with my own father – our opinions have become more informed. Thanks to the internet, each of the current generations has more or less equal access to the same raw information. What still differs, of course, is our personal experience of life and, therefore the way we interpret that information – (assuming that information plus experience matures into knowledge). However, the problem is that there is far more information available than I or anyone else will ever be able to absorb and thus my knowledge resides in certain areas only. My reading of this is that, as a father, I don’t need to try to impart new information – (unless asked), but I may be able to use my experience as a guide. 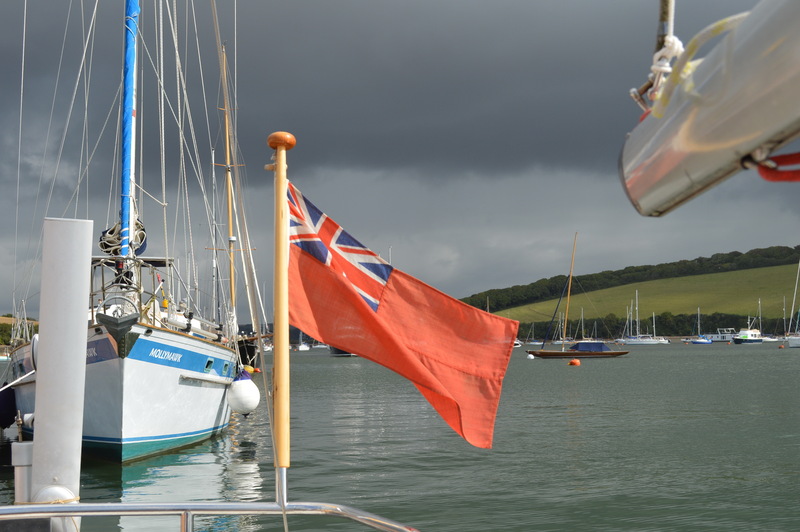 John Rousmaniere‘s comment about sailing could equally apply here: “The goal is not to sail the boat, but rather to help the boat sail herself”. In my relationship with my own father, this universal access to information wasn’t available. Therefore, he was always the one with the information, the experience and the knowledge. To his credit, he tried to pass his knowledge on to me. But the times when he was wanting to teach me and I was willing to learn did not always coincide and we used to become impatient with each other. Like many sons, I didn’t enjoy ‘being told’ and I was pleased, (if a lot more ignorant than I could have been! ), when I was old enough to make up my own mind and step out on my own. The lesson from my own experience, therefore, is that a lot of patience is required between father and son, the mantra being, “Be patient with me, Dad; be patient with me, Son.” With that thought in mind, I thoroughly enjoyed the trip. The feeling seems to be mutual because we have agreed to do it again. 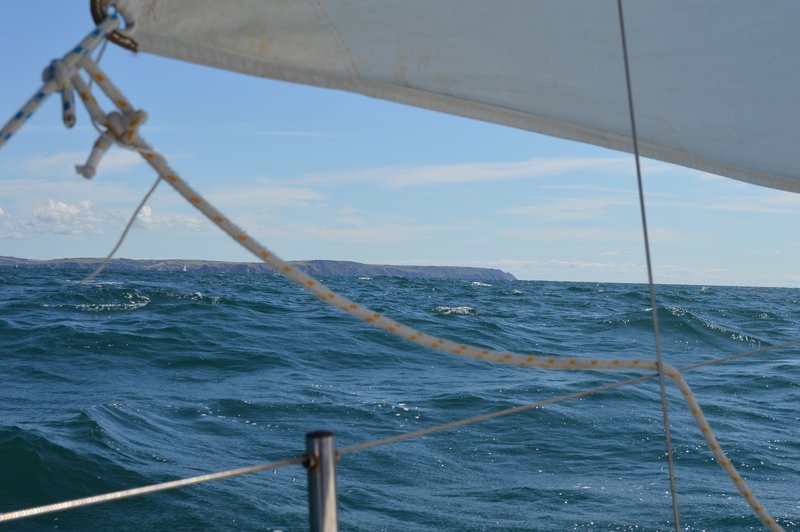 It is a close reach all the way to Bolt Head – wind force 4, full main and genoa giving an average 6 knots beneath a clear blue sky, a swell from the south west. 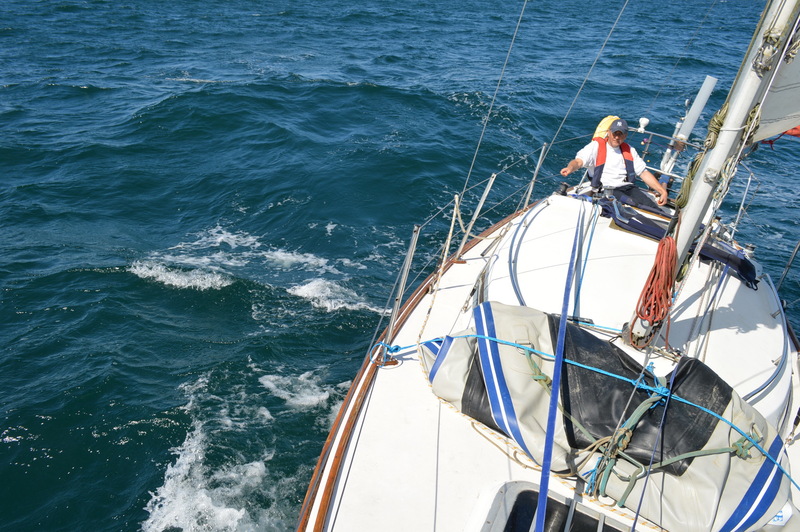 We head out to sea – as much for sheer exhilaration as for tactics, and then bear away to round Bolt Head ahead of some of the yachts that have stayed closer inshore. This is perfect weather for this Folksong. 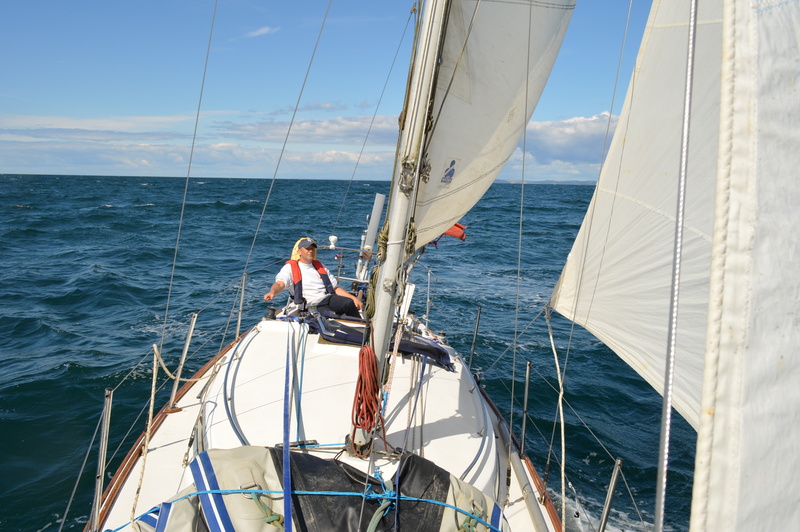 I can’t speak for others but my pride in this boat comes from her ability to hold a course and ride the swell in a blow and my disappointment comes when the wind drops and the lighter boats sail past us. 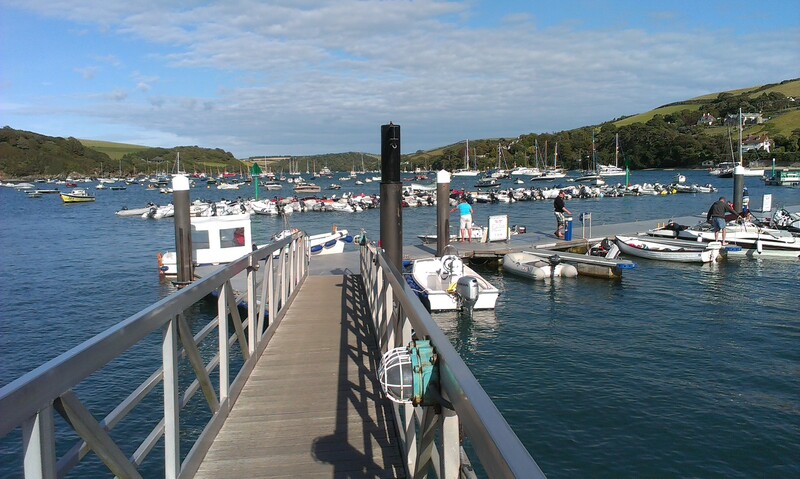 We find our way round the bar and enter Salcombe close to 1600. 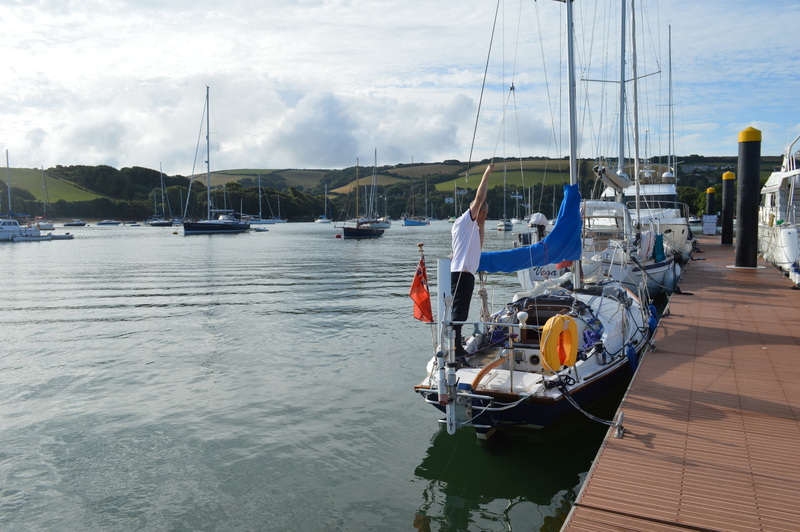 The harbour patrol, very helpful and efficient, directs us up river to the pontoon in The Bag because there is likely to be a swell overnight on the moorings off the main jetties. 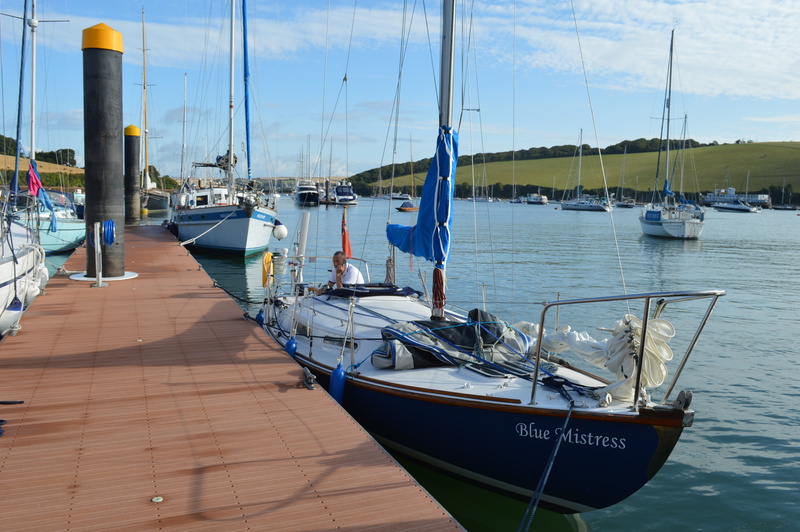 Our preference would be a swing mooring but we have arrived early and there is find plenty of room on the pontoon. 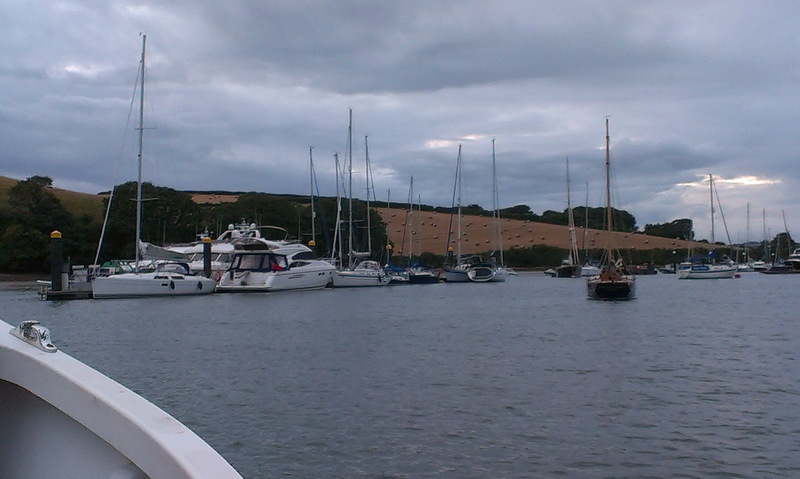 We go ashore. When we return in the evening, Blue Mistress is squeezed in between the heavy brigade. We enjoy our evening in the town. 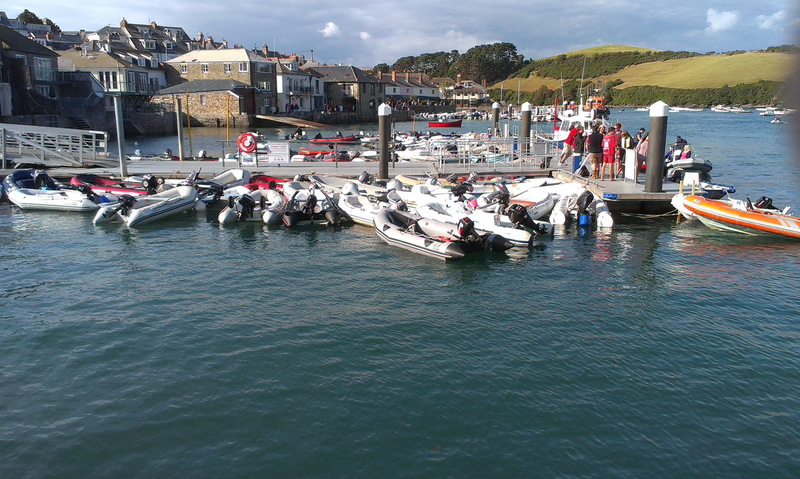 The number of inflatables is amazing, not just on the jetties, which is understandable given the numbers of yachts in the harbour . . .
. . . but also on the long pontoon where a formidable fleet is moored – (apparently every second-home has one). We would have left earlier the following morning but we are waiting for a squall to pass through . . .
. . . for me to stop taking photographs . . .
. . . and for him to get off the phone.